My Guys Moving & Storage is a dependable moving company in Frederick, MD, providing professional moving services ranging from small, local moves to large, long distance relocation. Our well-trained, affordable Frederick movers make the process easy so your move goes seamlessly as you relocate to your new home. We offer long distance & local moving as well as storage – everything you need for a great moving experience. Give us a call today to learn more about our services or to get a free estimate! My Guys Moving & Storage serves Frederick and surrounding areas such as Hagerstown, Thurmont and New Market. If you need movers in Frederick, MD with packing, moving and storage services, then we are the perfect company for you! We charge at an hourly rate with an additional trip/travel time charge. Our rates do vary based on the date and time of your move, so give us a call for our current prices. If you’re looking to save, moving mid-week, mid-month is generally the least expensive since demand is lower. We offer competitive rates for our services. Give us a call or email us for an estimate to get an idea of the cost of your move. We calculate your rate based on the number of guys needed for your move and the total time the move will take. A trip charge is added which accounts for the time our Frederick movers spend traveling to your location and then back to our office at the end of the move. Your move time begins when our guys arrive at your current space and concludes when the move is completed at your new location. The time also includes traveling between the two places. We estimate that it takes about one to one-and-one-half hours of moving time per fully furnished room. Remember, it may take a little longer if the guys need to use elevators or multiple flights of stairs to move your items, or if there is a long walk from where the truck can park to your front door. By choosing My Guys Moving & Storage, you can feel confident you are getting experienced Frederick movers at a great price. No matter how good your movers in Frederick are, accidents sometimes happen. Therefore, My Guys offers the industry's standard Limited Valuation Coverage at no additional charge. However, if you'd like extra protection or a lower deductible, please consider contacting your representative to discuss additional coverage. Call us today and choose My Guys as your Frederick movers! Whether you need to store a lot of items or just a few, My Guys can come up with a solution to meet your needs. Our Frederick movers will take care of all the hard work for you – loading your items at your current location and then unloading them into the storage facility. We make storage easy! When you’re ready to have your items back, we’ll get them where they need to go. Contact us today to learn more about our storage options! If you’re moving away from Frederick to another state, My Guys Moving & Storage is here to help with professional long distance moving services. Our Bethesda movers can ensure your items are ready for safe transport, giving you peace of mind as your valuables travel to your new location. We are an authorized agent of National Van Lines – a top company when it comes to long distance moving. Our partnership with them can give you even more confidence that your move will go as smoothly as possible. Let our Bethesda movers make your big move as easy as possible. Give us a call at (301) 340-1800 or fill out the form for a free moving quote! Are you a senior moving into a nursing home or retirement community? My Guys Moving & Storage is here to make the move as easy as possible for you. You can trust our Frederick movers for any services you need from packing to moving to storage. We also work with transitional companies that provide specialized senior moving services that can assist with all aspects of your move from helping you decide what to take with you to setting up your new home in a way that best meets your needs. We’ll work with them to ensure you have a pleasant moving experience. Call us today to learn more about how we make senior moving in Frederick easy! Packing can be more stressful than moving – where are you supposed to get all those boxes? My Guys Moving & Storage can help! We carry a wide variety of packing supplies. If you’re wondering how to transport all your clothing, think about a wardrobe box. These operate like a portable closet and contain a metal bar where you can hang your clothes. They fit about 18 to 24 inches of clothing hanging on a bar in your closet. You can rent a wardrobe box for $7.50 on the day of your move. We also have other packing supplies available for purchase such as boxes for flat screen televisions, mattresses, glass, plates and more! If you just need general packing boxes, we carry them in several sizes. Best of all, if your supply order is over $100, we’ll deliver it for free! Contact us today to learn more about the supplies we have available! My Guys has the experience to be among the top movers in Frederick, MD. 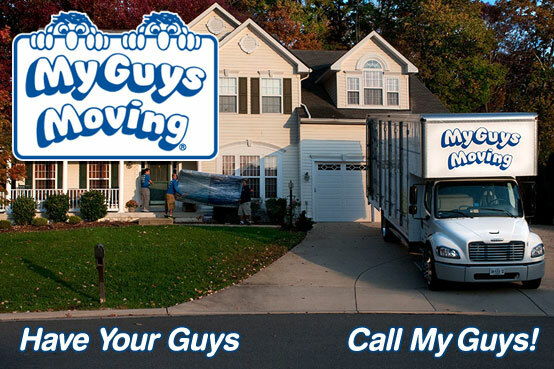 My Guys Moving & Storage, opened as the first My Guys franchise in June 2007. The Vogles, along with their professionally trained movers and relocation staff, provided local and long distance moving services in Frederick County and the Maryland panhandle until the moving company changed hands in 2014. Now the legacy lives on, as our moving company continues to expand with more great guys, and the same great service that made My Guys a household name. Whether you live in Carrollton, North Crossing, or anywhere in between, you can trust us for professional moving services. Contact us today by phone or email and you’ll see why we are the movers Frederick MD counts on! Adamstown, Ballenger Creek, Barnesville, Boonsboro, Brunswick, Burkittsville, Discovery-Spring Garden, Emmitsburg, Green Valley, Finksburg, Ijamsville, Jefferson, Keedysville, Keymar, Knoxville, Linganore-Bartonsville, Hagerstown, Hampstead, Manchester, Middletown, Monrovia, Mount Airy, Myersville, New Market, New Windsor, Point of Rocks, Rocky Ridge, Rohrersville, Sabillasville, Sykesville, Taneytown, Thurmont, Tuscarora, Union Bridge, Urbana, Walkersville, Westminster, Woodsboro, and areas throughout the Unites States.